This ARBOF Caster Base for Column Stands from FOBA provides versatile portability for the ASABA, AROBI, and ASLAI camera stands. 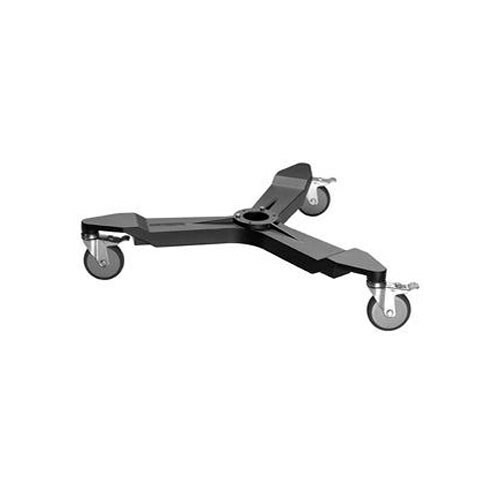 The casters each have a pedal lock to control rolling and rotating motion, and the design of the base allows one person to tilt the stand and roll it on two casters, to go through a door, for instance. The base weighs only 55 lbs (25 kg), so that one person can carry it, and additional 16.5-lb (7.5-kg) weights (available separately) can be added to the bottom of each of the three "legs" of the base. The casters have ball-bearings; a single pedal for each caster serves as a lock for rolling and rotating movement. The construction of the base enables the stand to tilt and roll on two casters, to get through a door, for example. The caster base can be carried around by one person only, as it weighs only 25 kg, excluding additional weights. To achieve better stability, an extra weight of 16.5 lbs (7.5 kg) can be screwed underneath each blade. Two screws are situated where the stand is screwed onto the base. They allow the column to be mounted into the right place at first try (does not work for the ASABA-column).